The marine fisheries sector contributed 1.4% to Malaysia’s Gross Domestic Product (GDP) in 2016, of which 76% is contributed by coastal fisheries sector. Twenty-four percent of this coastal sector output is contributed by the State of Perak, where Pangkor Island is located, making Perak the major contributor to the fisheries sector of Malaysia. This article aimed to identify the gap between development policies implemented and sustainable outcomes achievement, and subsequently provide suggestions for future adjustments to the sector development policies. The gaps identified include the difference between (1) improvement in the quality of human capital through workshops to improve income level and the actual output enjoyed by fishermen due to the financial limitation; (2) desired outcome of aquaculture project and the actual benefits seen due to limited physical, human and financial capital; (3) improvement of physical capital such as housing area and the financial capital available to service mortgage and replace equipments; and (4) livelihood strategies adopted and the fishermen desired livelihood outcome. A few recommendations were presented to reduce the above mentioned gaps, which include (1) strengthen the current structures and processes to ensure desired outcome of each policies and projects are achieved; (2) encourage the involvement of other operators on the island in moving towards improving the livelihood of fishermen; and (3) a long term plan of changing the culture of “hand to mouth” through education. HO, Stella Siew Neo; MOHAMAD, Jamilah; BINTI MOHD SATAR, Nurulhuda. 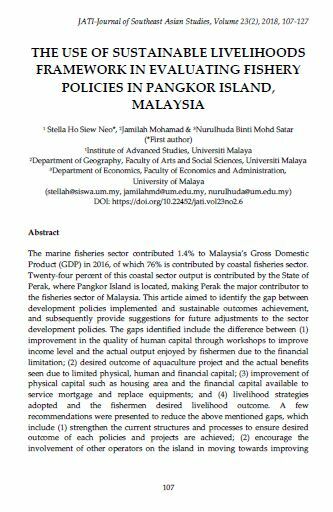 THE USE OF SUSTAINABLE LIVELIHOODS FRAMEWORK IN EVALUATING FISHERY POLICIES IN PANGKOR ISLAND, MALAYSIA. JATI - JOURNAL OF SOUTHEAST ASIAN STUDIES, [S.l. ], v. 23, n. 2, p. 107-127, dec. 2018. ISSN 2600-8653. Available at: <https://jati.um.edu.my/article/view/15415>. Date accessed: 26 apr. 2019. doi: https://doi.org/10.22452/jati.vol23no2.6.